Record Store Visit: Generation Records - New York, NY - 11/21/12, a photo by Tim PopKid on Flickr. The 2nd stop on my trek through New York City brought me to Thompson Street and my favorite record store in the city, Generation records. I've been going to this store since 1995, it's by far the best "punk" store in the area, though they stock significantly more than just punk rock. I remember the very first time I went to Generation. It was before the big crackdown on stores selling bootleg live CDs. I bought a Beck bootleg here called I'm A Schmoozer Baby that still sits in my CD collection to this very day. It's also been a key store to buy some of the best punk around. I remember back when they kept the 7"s on the front counter and you had to stand right next to everyone checking out to browse through them. Generation used to be the best store in an area PACKED with great record stores. 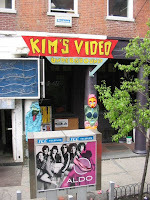 Kim's Underground used to be right at the end of the corner on Bleecker Street. That was another store that I spend countless hours in, combing through the stacks, sometimes buying albums based purely on artwork. They mainly had an indie rock lean, but I bought so many things by so many different bands over the years that I couldn't classify them as indie exclusively. 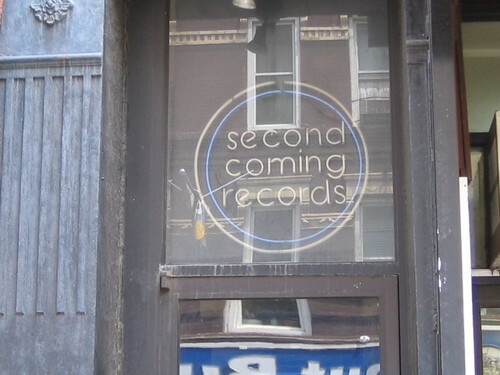 Right around the block on Sullivan Street there was another store called Second Coming. This was another big booleg store, though on my very first trip there I found the 2nd pressing of the Beck 10" A Western Harvest Field By Moonlight (Notice I was really into Beck in the mid 90's? ), so it is a store that also will always hold a special place in my heart. Both of these have long since shuttered their doors and the village is a worse place because of it. That was right outside this shop. Back to present day Generation records. Now the 7"s are downstairs with all of the used CDs and they are still absolutely worth digging through. I always find something of interest and on this day I picked up a Midway Still 10" and a Spatula 7". @swamipat did even better and picked up a several LPs and a rare Hot Snakes Tour 7" that was hanging on the wall. For me, no trip into NYC is complete without a trip to generation. it's still the best store in the city and one of the best stores I've ever had the privilege of going to. Hey, saw your website. Love the concept. You might like mine too. 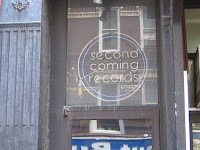 photos of old and new record stores I've visited, and playlists with you tube links. I've been to many record stores (I buy too many records too). Tried to send you an email but couldn't figure out how. delete this if it bothers you. Cool, just subscribed to your RSS feed. Thanks!